Know all about the festival of Durga Puja and check out gifts to send to your loved ones in India and abroad. 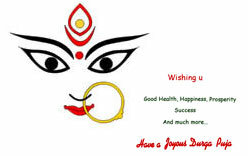 The festival of Durga Puja has been celebrated since ages all over India, especially in the eastern regions. 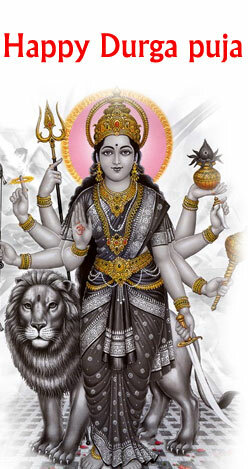 Durga, meaning invincible, is the supreme goddess, also referred to as 'Adi Shakti' by the Hindus. She is the one, who slayed the powerful demon 'Mahisasura' and restored peace on earth and heaven. Since then, Maa Durga has been worshipped with great devotion and ardor by the Hindus. Maa Durga is also known by different names such as Santoshi Mata, Ambika, Parvati and many more. As she killed the buffalo-demon Mahisasura who even dethroned Indra, she is also known as 'Mahisasura Mardini'. The festival of Durga Puja falls in the month of Ashwin which corresponds to the period between September and October, as per the Gregorian calendar. During the festival, pandals with elaborate design are built where goddess Durga is worshipped and hordes of devotees pour in to pray to the goddess and seek her blessings. Embellished with elegant and resplendent artistic designs, the pandals and the Idol of the Goddess are the main attraction during the festival for which even prizes are awarded. During the festival devotees can be seen indulged in singing bhajans at the pandals and Maa Durga aarti, which is conducted on all three days of the puja. On the last day of Durga Puja, which is known as Vijadashami, the goddess is given a tearful farewell by her devotees and is immersed in a nearby river or lake. 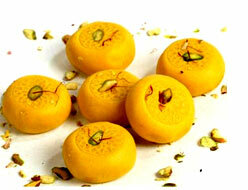 There are innumerable rituals, customs and tradition associated with this festival. Explore and find all the information associated with this great Indian festival.